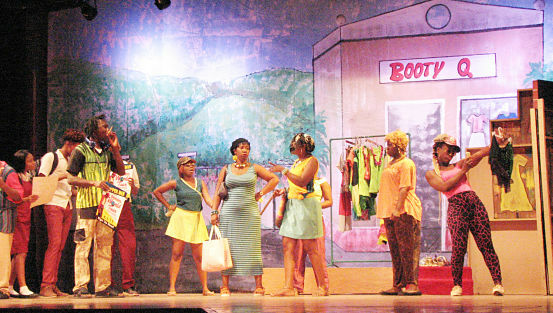 AH YAH SO NICE: Members of the Pantomime Company in scenes from the lively production, now playing at the Little Theatre in Kingston. IN every nook and cranny across Jamaica dancehall sessions are both a blessing and a curse. Promoters and vendors are glad for the revenue generated; young party lovers relish the opportunity to bask in the vibes. But you have those ‘decent, upstanding’ folks who can’t stand the “ole nayga” music and constantly plead with the police to do something about the disturbance, as they are unable to get their proper night rest. All that and much more plays out in Dapper Dan: The Anansi Man, the latest LTM National Pantomime that is characteristically replete with visual power, humour and musical oomph. Though the plot is a bit wafer-thin and the story plays out quite predictably, the production scores points for painting a vivid and realistic portrait of typical and ever-topical Jamaican subject matter, as well as the noteworthy exuberance of its cast in bringing the show to rousing life. Directed by Robert ‘Bobby Clarke’, with script and lyrics by Barbara Gloudon (assisted by members of the Pantomime Workshop), the production introduces us to a ‘swaggerific’ central character – the titular antihero (played with sly charm by Ray Jarrett), who is more area don than show promoter. But the people love and worship him, even when it’s clear that he’s taking them for a ride. The police, meanwhile, are hot on his trail, particularly Woman Superintendent (Faith Bucknor), Sergeant Milestone (Kevin Halstead) and their two squaddies (Jerry-Neal Richards and Janelle Wilson), who make it clear that Dapper Dan will no longer be able to use his dollars to do as he pleases. Things heat up when Dappa announces a talent contest aimed at selecting the best dancer to go on a world tour to showcase their skills. Everyone is beyond excited. This turn of events could mean a spike in business at the ‘Booty Q’ for Mama Blaze (Maxann Stewart-Legg) and her two free-spirited daughters/shop assistants Cherry (Rachael Allen) and Goody (Michaela Brown), who eagerly want to enter the contest. 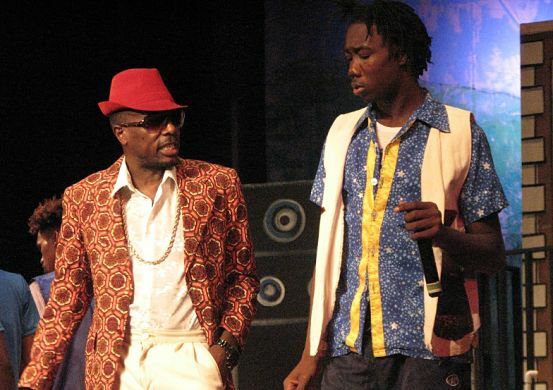 Nutsy (Donovan Stewart) and Selector, Dappa Dan’s sidekick (Jahmali Rhoden) are not complaining either. The excitement even attracts young bookworms Tasha (Jasmine Lue) and DiMario (Ricardo Campbell), but their uptight guardians Uncle Willy (Shama Reid) and Miss Elise (Latoya Newman-Morris), would rather see them chained to a bedpost than have them participate in anything put on by Dappa Dan, whose noisy events they do not approve of. The police step up their surveillance and Dapper Dan proceeds with his contest. But what happens when the people feel Dapper Dan hasn’t been totally up-front with them? Will be lose their loyalty? Will the police finally get their man? Once again, Gloudon and Clarke have put together a show that, in spite of its lull moments, is never less than humourous and true-to-life. The songs are not as memorable, as in previous pantomimes but numbers like “Lock Off De Dance,” “Police Life” and “Nah Tek We Fi Fool” hit the spot. Set design, costuming and props reflect commendable craftsmanship and attention to detail.